The Mark of Kane 2 0 Orson Welles' masterpiece, 70 years on. By Nigel Andrews Citizen Kane It storms after us down the corridors of history like its own hero. Bloated, grotesque, tremendous; destroying as it goes; influencing and renewing too. Every fresh decade calls it the best film ever made. Every new generation poses and tries to answer the question, "Why?" Citizen Kane is 70. Three score years and 10 after its New York premiere in May 1941, it is still everywhere. Not just in its own flesh, as reissue, telecast or DVD, but in the monstrous spell it casts on filmmakers. Long after the critics-turned-directors of the French New Wave first made Orson Welles a demigod – remember the young hero of François Truffaut's Les Quatre Cents Coups dreaming of stealing stills from a cinema showing Citizen Kane? – the figure of the haunted megalomaniac, presiding over the shards of his own life, is inescapable. From Michael Corleone in the Godfather films to Daniel Day Lewis in There Will Be Blood, via Robert De Niro's Jake La Motta in Raging Bull (the pugilist's Citizen Kane), the examined life is worth living, irresistibly, for an audience nourished on themes of ambition, self-destruction and the war between private and public actions. No less ubiquitous since Kane has been the screen drama told through conflicting memories, from Rashomon and Last Year in Marienbad to Memento and Magnolia. No less "modern" in style, especially since Robert Altman added fresh colours to Kane's master sketch, is the crowded fresco of life enriched with overlappings of plot and dialogue. Kane got there first nearly every time. When it didn't, its brilliance destroyed the memory of predecessors. Orson Welles didn't bother with the ABC of filmmaking. A precocious marvel, aged 25 when he made Kane, he went straight to the XYZ. X for Kane's home, the mist-wreathed castle of Xanadu, a megalomaniac's dream built atop a man-made mountain. Y standing for "Why?" – again the simplest, most important question. Why was Kane successful, why was he a failure? Why was he a triumph and a tragedy? Why is he, simultaneously and almost symbiotically, all of us and none of us?" And Z? That has to be for Zaharoff. Many Kane lovers – me included – think that is how it all began. In 1936 Welles, a radio-producing prodigy in New York, helped to craft a March of Time obituary of the munitions tycoon Sir Basil Zaharoff. Dramatised vignettes opened with Zaharoff's secretaries burning his papers in the giant fireplace of his castle. Later, witnesses are called to remember Zaharoff's life. Later still the dying, castle-dwelling Zaharoff, played by Welles, is given his own voice and his own valedictory cameo. He announces a wish to be wheeled into the sun "by that rosebush". We know what the rosebush became. "Rosebud". The most important uttered sound in Citizen Kane, the dying Kane's last word, the secret to his sorrow. It is the name of his childhood sledge, ultimately thrown to the flames as oblivion sears the movie's final scenes. Author and one-time film critic Jorge Luis Borges, who loved Citizen Kane, thought the Rosebud motif its single major weakness. The film, he wrote, "has at least two plots. The first [is] of an almost banal imbecility ... At the moment of his death, [Kane] yearns for a single thing in the universe: a fittingly humble sled that he played with as a child!" 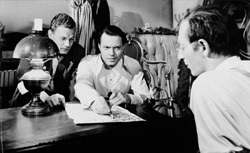 In 1972, the critic and filmmaker Peter Bogdanovich wrote The Kane Mutiny, attacking Kael and re-championing Welles. I think Bogdanovich is right. It isn't the concept, it isn't the dialogue, it isn't even the characterisation that makes the movie a masterpiece. It is the vision. What do we mean by that? Let's go back to Borges. What was the second of the "two plots" he finds in the film? It is, he says, far superior to the Rosebud plot. It is "the investigation of a man's secret soul by means of the works he has made, the words he has spoken, the many destinies he has destroyed ... The film teems with forms of multiplicity, of incongruity ... the detested Charles Foster Kane is a simulacrum, a chaos of appearances ... In one of Chesterton's stories" – Borges's beloved GK Chesterton – "the hero observes that nothing is so frightening as a labyrinth without a centre. This film is precisely that labyrinth." You can script a labyrinth. Mankiewicz helped to do so. But a writer's pen cannot carve and build it, give it size and echo. The labyrinth in Kane, the tomb of life, the palace of death, is a pure delirium of cinema, the creation of the man behind the camera. Its mirrored infinity is crafted by a director who loved reflections (the fairground hall-of-mirrors shootout at the climax to The Lady from Shanghai), its shadowed enormities by a man who loved shadows (Touch of Evil). Supremely Wellesian is the film's obsessive "showdowning" – sometimes you have to invent a word when one isn't available – between the theatrical and the cinematographic. No one has come near this filmmaker in understanding this tension. Citizen Kane is all "about" the quest to pierce through proscenium enactment to reportorial truth; and to wonder, in the process, if even reportorial truth is the last level of reality. The Kane sets and ambience are monstrously theatrical yet we keep going through them, behind them, above them. The sign over Susan Alexander's nightclub is – in an "impossible" shot achieved with flyaway scenery – travelled through by the camera. It's a world of greasepaint and artifice, challenging us to find concealed truths. Welles's own portrayal becomes more theatrical by the reel. To play the older Charles Foster Kane he spent six hours each morning in the make-up chair: a grown-up playing charades. Yet ultimately the force of the movie, aided by the power of our curiosity, blows the sense of cosmetic make-believe apart. Rosebud is part of the same action. What seems a fairy-tale simplification, a motif from the props department, opens up to become part of the movie's resonance. Welles was an amateur magician later in life; his last feature, F For Fake, was all about conjuring and imposture. No wonder the facile-seeming key to Kane's story – the name of his childhood sled – may be the actual key. More literally, it is the bud that opens for moviegoers by being the bud that doesn't open in the movie. On screen "Rosebud" tells us Kane's life was nipped in its growth by a too-early rendezvous with wealth and destiny. But in our experiencing of the film "Rosebud" communicates the opposite. The spell of the word grows and grows. Like so much in the movie it starts as a hint, and expands by a process of change, association, counterpoint and contradiction into the holistic and all-comprehending. The part stands for the whole. The part becomes the whole. The pattern is there throughout, from the famous breakfast scene – 16 years of a marriage elided into a two-minute mealtime montage – to the way the idea of the "jigsaw" becomes revelatory and all-pervading. We look back from Susan Alexander Kane's epic bemusement over a literal jigsaw in the final scenes to the whole jigsaw technique this montage-rich movie has deployed: from the early News on the March newsreel to the skittering ellipses of Kane's tycoon career. Reality in tension with artifice. Crystallisation in tension with expansion. The distilled in tension with the discursive. And, of course, fact in tension with fiction. Was Citizen Kane a portrait of the multimillionaire newspaper magnate William Randolph Hearst? Of course it was. Hearst recognised it, banning any mention of the film in his publications. Louis B Mayer, on behalf of a Hollywood threatened with dire reprisal by Hearst, offered RKO Studios $805,000 to burn all prints and the negative. At the same time, Citizen Kane wasn't about Hearst at all and has outlived him as an iconic world memory. You could as justly argue, and probably should, that Kane is Joseph Conrad's Kurtz. Heart of Darkness (later to inspire Francis Coppola's Apocalypse Now) was the debut film on which Welles had started pre-production. Too expensive, it gave way to Kane. But the stories are virtually identical. An "explorer" (in Kane, an investigative reporter) voyages "up-river" (against tides of resistance) through a "jungle" (of conflicting and contradictory information) to find a man – or, in Kane, the secret of a man – who has lived as a wilful, ruthless, overlording tyrant.